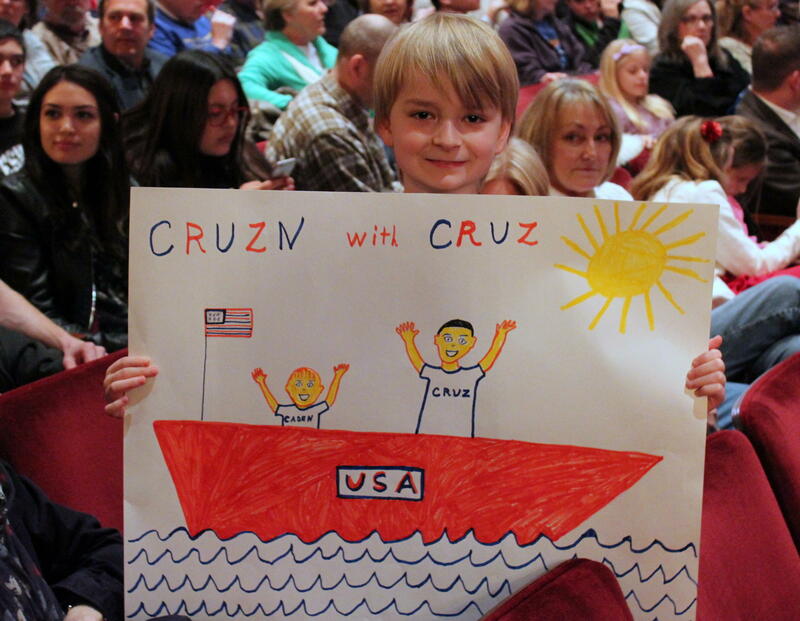 Caden Quinn, who attended Wednesday's rally for Ted Cruz with his grandmother, Elizabeth Foster, holds a sign the two made. Republican Sen. Ted Cruz brought his presidential campaign to Kansas during an appearance in Overland Park Wednesday night. Elizabeth Foster was one of around 2,000 people who came out for the event. She called seeing Cruz “better than the Super Bowl” and said she likes his Christian values. “I feel like he will fulfill everything that he is standing on now as a candidate. I think he’ll follow through and is someone that my family can be proud of,” Foster said. Cruz hammered Republican front-runner Donald Trump during the speech. Cruz also focused on other issues including the military and immigration. “We are going to end sanctuary cities by cutting off taxpayer dollars and we are going to end welfare benefits for people here illegally," Cruz said. "When we do that, we are going to see millions more jobs for American citizens. We’re going to see wages coming up." Cruz claimed Trump would compromise with Democrats on a Supreme Court nominee. “I give you my solemn word that every justice I put on the Supreme Court will be a principled constitutionalist faithful to the law who will vigorously protect the Bill of Rights,” Cruz said. Kansans will cast their votes in a presidential caucus on Saturday. Republican Sen. Marco Rubio has a campaign stop scheduled for Friday in Wichita. Democratic Sen. Bernie Sanders will be campaigning in Lawrence on Thursday. Vermont Sen. Bernie Sanders rallied thousands of supporters in Kansas City today. As KCUR’s Frank Morris reports, the Democratic primary candidate made a lot of campaign promises. Sanders says the financial system is rigged against working people, and that Wall Street is running Washington. He promises major changes: more uniform wealth distribution, lower poverty levels, universal health care, college loan debt relief, gun control, and judicial reform, to name a few. Kansas hasn’t held a presidential primary election since 1992. State officials say the estimated $2 million price tag is just too high. Instead, Republicans and Democrats across the state gather in convention centers, schools and churches for caucuses. Ahead of the March 5 caucuses, KMUW’s Sean Sandefur explains how this complicated system works. Kansas Gov. Sam Brownback has endorsed Florida Sen. Marco Rubio in the race for the Republican presidential nomination. As KPR’s Stephen Koranda reports, Kansas Republicans will pick presidential candidates in the March 5 caucus. Dozens of young adults took part in a civic engagement workshop in Wichita last week. They listened to their peers in the Republican and Democratic parties. The workshop, put together by Wichita Urban Professionals and Young Professionals of Wichita, was part of an effort to educate millennials and to get them involved in the political process.